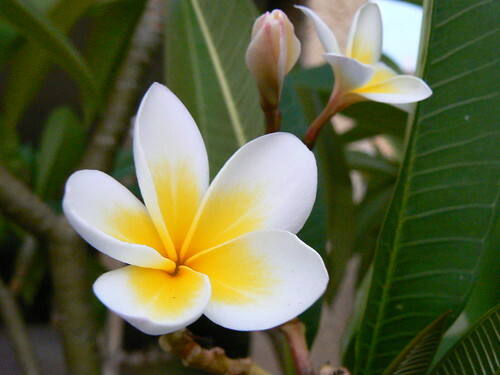 Plumeria (Frangipani), originally uploaded by Ayala Moriel. Proceeds go to the Bloedel Floral Conservatory in Queen Elizabeth Park in Vancouver. It is thanks to this wonderful tropical gem at the heart of our raincity that I was able to find a real, living frangipanni flower for reference. Unfortunately, the City of Vancouver has cut its funding to sustain the conservatory and it is scheduled to close March 1st, 2010. This will leave tens of tropical birds and plants homeless, and is a huge loss for the people of Vancouver! When you purchase Frangipanni Gloves, you are also helping this cause. Frangipannin Gloves is offered for a limited time only, until March 1st, which is the scheduled date for closing Bloedel Floral Conservatory. For every bottle sold, $50 is donated to Bloedel Floral Conservatory in order to prevent its scheduled shut-down March 1st, 2010. ($30 for mini bottles). If the fundraiser succeeds, and it will not close - Frangiapnni Gloves will remain in our regular collection and I will continue to donate money to Bloedel, so that we can continue to enjoy the scent of real living frangipanni flowers! It can be purchased on Etsy or via Ayala Moriel Parfums. 1. Make a donation at any Royal Bank of Canada branch by quoting our name "Friends of the Bloedel Association" and account number 06080 003 1006428. 3. Use our secure PayPal FundRazr page on Facebook by clicking here: http://bit.ly/6GsZWt. If you are a member of Facebook, please publish your comment and donation to your stream. This will help us spread the word about our important cause.